Learning how to defend yourself from within your vehicle is an important skill for every person who carries a firearm. The course has been out for some time now, but admittedly I just recently went through Concealed Carry.com's Vehicle Firearm Tactics Course. As you might guess it is all about the unique challenges that you must address when fighting from within or around your vehicle. Besides enjoying all things defensive handgun training related, this topic hits especially close. In my youth I was carjacked, and in this post, I explain the incident and lessons learned. Back then I didn't know the difference between a Ruger and a Luger. Thankfully, God had a plan for me and I survived. We spend a huge amount of time in our vehicles, and it just makes sense that developing skills that give us a better chance at surviving a deadly-force encounter while we are in or around our vehicles makes sense. But because very rarely, if ever, do we have the chance to shoot up a vehicle, we often don't understand what environmental limitations or considerations come with shooting through various areas of the vehicle. If you have never seen how shooting through side glass vs the windshield glass, or tinted vs non tinted glass effects your bullet, you will see exactly in this video. What about which parts of the vehicle truly offer decent cover and what to expect when rounds are deflected off of these metal parts? These topics are covered in the class and set the foundation of why certain techniques work or don't work in real life. As far as technique, the course addresses everything from drawing while seated in the vehicle, to how to appropriately present to threats in various areas in or around the vehicle. By demonstrating the difficulties of drawing from different carry positions, it gives the student an understanding of why one method of carry might be preferred over another. Also addressed are the considerations one should take if there are passengers in the vehicle. Of course topics of how and when to use the vehicle as cover and the various ways to shoot from these positions are demonstrated and explained extremely well. Tasks like drawing a firearm and bailing out of a vehicle may seem simple, until actually applied. Only then are the difficulties realized. These topics are covered in the course, with the best methods explained. A particular aspect of the course that I appreciated was this theme of understanding four “Vehicle Fighting Priorities.” It is easy to jump right into learning a technique, and not understand when the technique is useful. After all, not every situation requires the same response. By explaining a hierarchy of priorities, it gives the student a context of where to place these skills in their response decision making process. If you have a similar mindset, here is my answer, techniques like these are an essential part of understanding how to use your gun. 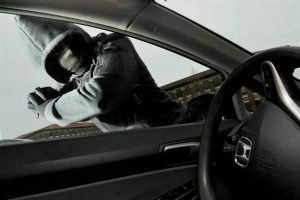 It's no different than learning how to shoot while moving, or defend yourself in your home with a gun, there are techniques specific to using your gun in a vehicle that may save your life. The great thing is this class is not geared only to young shooters with zero percent body fat. The course is such that the techniques are demonstrated and explained in context. Essentially explaining the ‘why' of the technique as much as the ‘how' of the technique. For example, an automobile is used in the course, but maybe you own a truck. The same fundamentals apply, and because you understand the reason behind shooting from a specific position, or drawing a certain way, you can adapt it to fit your specific needs. Another great thing is that you can watch the video segments, and actually practice at home in your specific vehicle. This allows you to gain confidence in the techniques at your own pace without any anxiety. Overall, the 145 minute course is something that I have recommended to many people because it is so thorough and because of its logical progression of technique. Check out the Vehicle Firearms Tactics course, and I believe you will find it well worth the price.